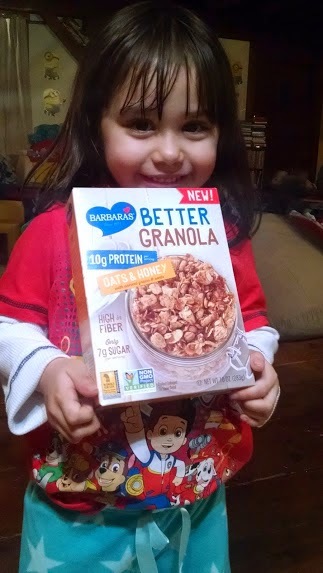 Barbara’s Better Granola made its debut at the Natural Product Expo West back in March, and has quickly become a favorite among families who love granola as a cereal or simply to grab and snack on. I was excited when I heard about Barbara's adding this new line of delicious, protein packed granola to their product offering, and couldn't wait to get my hands of the two yummy flavors to try with my family. "Barbara’s Better Granola is a satisfying blend of toasted oat clusters and puffs, almonds, and ancient grains and seeds such as quinoa and flax seeds, and boasts 9-10 grams of soy-free protein and 6 grams of fiber per serving. Barbara’s Better Granola is Non-GMO Project Verified and is packed with 28-30 grams of whole grains and more than 200 milligrams of ALA omega 3’s in every two-thirds-cup serving. It is great eaten alone as a snack, with milk or as a topping on yogurt." A couple of weeks ago, the kind folks at Barbara's sent along a box of their new Barbara's Better Granola for my family to try. Before I could get the cereal bowls and milk out, my husband has opened the two boxes for him and the girls to do a taste test. They each reached in the box and grabbed a handful. Seconds later, all I could hear, besides crunching sounds, were my family letting out grunts and other sounds, letting me know that they loved the granola. My husband on the other hand found that he liked the Oats & Honey flavor more. I was expecting this, as he usually reaches for cereals that are made with oats and honey. Like my girls, he couldn't get over the different oats and grains this new line of granola from Barbara's had. "Not only is our new line of Barbara’s Better Granola a good source of protein that comes from oats, almonds, and wheat, but it also delivers other added benefits consumers are looking for, such as ancient grains and seeds, whole grains, ALA omega 3’s and fiber." I find breakfast to be on the of the hardest meals to serve my girls, as they are not morning people, and the last thing they want to do once they roll out of the bed in the AM is eat, or have to make decisions on what to eat. But, whenever I pull out a box of Barbara's Better Granola and set out on the dining room table with milk and their cereal bowls, they quickly make a b-line for their chairs and wait for me to pour them a bowl. And, on those occasions when the girls ask for breakfast at dinner, I find that they are reaching for the box of Barbara's Better Granola. :-) I also love hearing my girls ask for some of Barbara's Better Granola to add to their yogurt, or as a crunching topping for their cup of ice cream. There are so many ways to eat Barbara's Better Granola, but I have to say my personal favorite is to grab a handful and snack away. This protein-packed granola really does fill you up, and is satisfying at breakfast, lunch, or even snack time. Barbara’s offers a full line of delicious cereals and snacks, including popular crowd favorites like Puffins cereals, Snackimals cereals and cookies, Morning Oat Crunch, Cheese Puffs and more. Barbara’s Better Granola is available at Sprouts and Stop & Shop stores as well as Amazon.com. Other Barbara’s products are also available nationally at major retail grocery stores and natural food stores. For more information about Barbara’s Better Granola and other Barbara’s products, please visit the Barbara’s website at www.Barbaras.com. Barbara’s was founded in 1971 by a 17-year-old young woman with a passion for creating great-tasting food from simple, wholesome ingredients. The company’s mission remains true to Barbara’s original vision: that life is delicious, and is worth taking a bite out of every day! Based in Marlborough, Mass., Barbara’s is committed to making positive contributions to the world with donations to national and local nonprofit organizations, including the National Wildlife Federation and the National Audubon Society’s Project Puffin. For more information, please visit www.Barbaras.com or visit Barbara’s on Facebook or Twitter. I used to eat cereal all the time but haven't had it for years. This cereal looks really healthy and one that I will look for in the store the next time I go grocery shopping.